Lettuce, onions, bell peppers, chopped tomatoes, shredded cheese. Grilled chicken, shrimp, steak, lettuce, onions, bell peppers, chopped tomatoes, shredded cheese. Grilled chicken, lettuce, pico de gallo, and avocado slices. #1 One taco, two enchiladas, Mexican rice. #4 One enchilada, two tacos, and one chile con queso. #5 Two enchiladas, refried beans, and Mexican rice. #6 One enchilada, one taco, refried beans, and Mexican rice. #7 One enchilada, one chile relleno, refried beans, and Mexican rice. #8 One enchilada, one tamale, refried beans, and Mexican rice. #10 Two tacos, refried beans, and Mexican rice. #11 One burrito, one enchilada, and one taco. #13 One burrito, one enchilada, and one chile relleno. #15 One burrito, one enchilada, and one tamale. #17 One burrito, one enchilada, refried beans, and Mexican rice. #22 One chile relleno, one burrito, and one taco. #23 One taco, one burrito, refried beans, and Mexican rice. #24 Two tamales, refried beans, and Mexican rice. All of our shredded chicken dishes are prepared with onions, tomatoes, and peppers. Chicken is cooked on the bone for the best flavor. Grilled chicken or steak chunks covered in cheese sauce. Served with lettuce, shredded cheese, bell peppers, onions, tomato slice, Mexican rice, and three tortillas. A LITTLE BIT OF EVERYTHING! Taco, bean chalupa, chile relleno, tamale, enchilada, refried beans, and Mexican rice. Crispy flour tortilla filled with your choice of shredded chicken or ground beef. Finished off with lettuce, shredded cheese, guacamole, sour cream, and a slice of tomato. One burrito and one enchilada filled with shredded chicken, covered with our enchilada red sauce. Topped with lettuce, pico de gallo, sour cream, and guacamole. A crispy flour tortilla stuffed with your choice of grilled chicken or steak and cooked with onions, bell peppers, and tomatoes. Topped with a splash of cheese sauce, lettuce, sour cream, shredded cheese, guacamole, and a slice of tomato. Four rolled corn tortillas filled with shredded chicken or shredded beef and fried to a golden brown. Served with lettuce, sour cream, guacamole, and a slice of tomato. Three tender steak or grilled chicken tacos. Served with refried beans, Mexican rice, and a side of pico de gallo. Steak chunks covered in red or green sauce. Served with refried beans and Mexican rice. Includes three tortillas. Pork wings covered in green tomatillo sauce. Served with lettuce, guacamole, sliced tomato, and rice. Includes three tortillas. Tender beef topped with grilled onions. Served with lettuce, guacamole, a slice of tomato, refried beans, Mexican rice, and three flour tortillas. A flour tortilla filled with your choice of meat and deep fried to a golden brown. Covered in cheese sauce. Served with lettuce, sour cream, pico de gallo, guacamole, refried beans, and Mexican rice. Two chimichangas, one shredded chicken and one ground beef, deep fried to a golden brown and covered in cheese sauce. Served with lettuce, pico de gallo, sour cream, guacamole, and Mexican rice. Two flour tortillas stuffed with beans and shredded chicken. Topped with melted cheese, red sauce, lettuce, sour cream and slice of tomato. One flour tortilla filled with your choice of shredded chicken or ground beef. Covered with melted cheese, red sauce, and topped with lettuce, sour cream, and a slice of tomato. A large flour tortilla with rice and beans inside and stuffed with your choice of grilled chicken or steak and cooked with onions, bell peppers, and tomatoes. Covered on top with both red and cheese sauce and topped with lettuce, pico de gallo, shredded cheese and guacamole. One flour tortilla stuffed with your choice of shredded chicken or ground beef. Covered in melted cheese, red sauce, and topped with lettuce, sour cream, and a slice of tomato. Two cheese enchiladas with beef cooked with tomatoes, onions and pepper to give it its flavor. 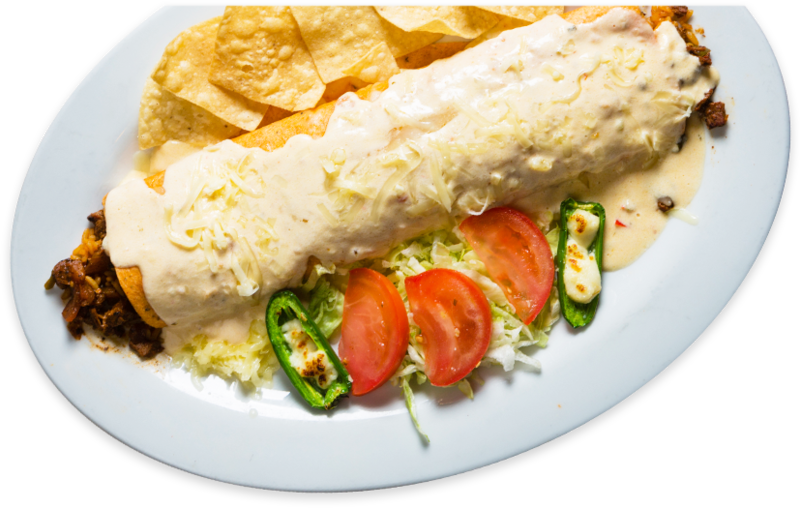 Topped with melted shredded cheese, and your choice of red or green sauce to top off the enchiladas. Served with lettuce, sour cream, guacamole and a slice of tomato. One shredded chicken enchilada with red sauce. One ground beef enchilada covered with cheese sauce. One bean enchilada covered with green sauce. Served with lettuce, sour cream, a tomato slice, and Mexican rice. Supreme combination of enchiladas stuffed and rolled with one shredded chicken, one bean, one cheese, and one ground beef enchilada. Topped with our red enchilada sauce, lettuce, sour cream, shredded cheese, and a slice of tomato. 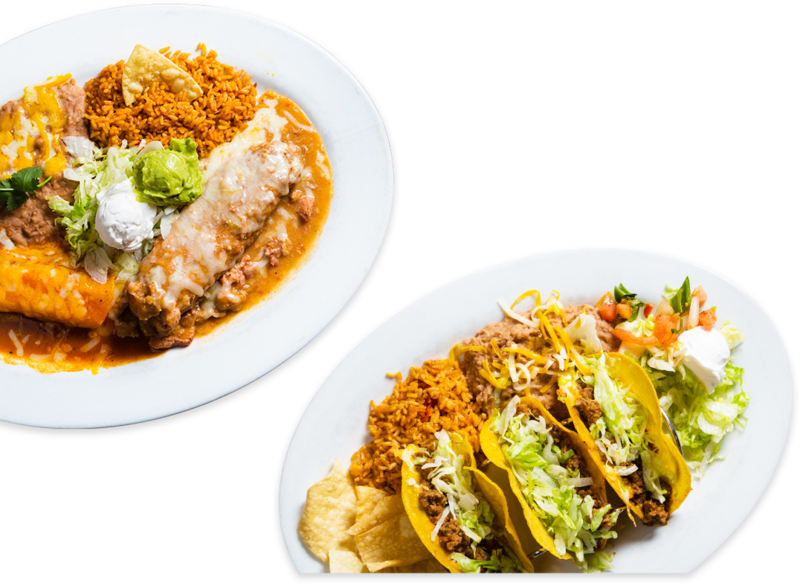 Three enchiladas filled with your choice of steak or grilled chicken. Covered with melted shredded cheese and enchilada red sauce. Served with lettuce, sour cream, a tomato slice, and Mexican rice. A flour tortilla stuffed with beans and your choice of shredded chicken or ground beef. Served with lettuce, sour cream, guacamole, and a slice of tomato. Two quesadillas stuffed with your choice of grilled chicken, steak, or a mix. Cooked with sautéed onions, bell peppers, and tomatoes. Served with lettuce, sour cream, pico de gallo, and guacamole. A flour tortilla stuffed with steak or grilled chicken. Covered with cheese sauce. Served with refried beans and Mexican rice. A flour tortilla stuffed with steak or grilled chicken, lettuce, pico de gallo, and sour cream. Topped with cheese sauce. 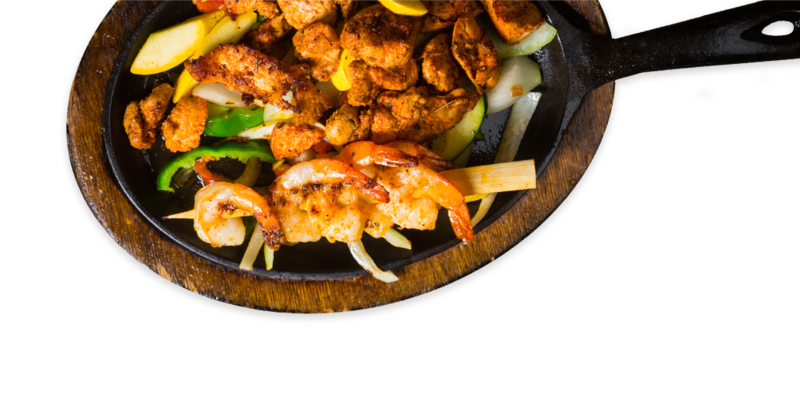 Our fajitas are served with your choice of meat, sautéed onions, bell peppers, and tomatoes on a sizzling skillet. Served with lettuce, sour cream, pico de gallo, guacamole, refried beans, and Mexican rice. Three tortillas. Steak, chicken, shrimp, and Mexican sausage. Steak, chicken, mushrooms, and pineapple slices. Steak, chicken, Mexican sausage, shredded cheese. Shrimp, mushrooms, sautéed onions, shredded cheese. Served with refried beans and Mexican rice only. Tortilla chips covered in melted cheese and topped with refried beans, ground beef, and shredded chicken. Finished off with lettuce, shredded cheese, sour cream, and a slice of tomato. 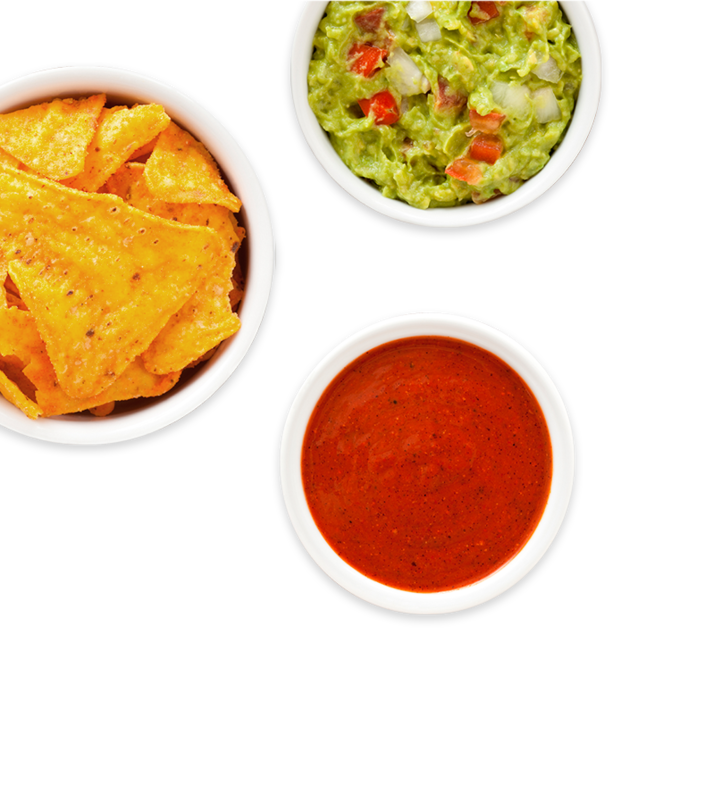 Tortilla chips with your choice of grilled chicken, steak, or mix and cooked fajita style with onions, bell peppers, and tomatoes. Covered in melted cheese, lettuce, sour cream, shredded cheese and a slice of tomato. Grilled chicken breast seasoned with our special recipe. Served with bed of cabbage, steamed veggies, and mexican rice. Grilled chicken breast seasoned with our special recipe. Served with lettuce, guacamole, slice of tomato, Mexican rice, and three tortillas. Grilled chicken breast covered with cheese sauce. Served with refried beans, Mexican rice, and three tortillas. Grilled chicken breast topped with bell peppers and bacon. Covered in cheese sauce. Served with refried beans, Mexican rice, and three tortillas. Grilled chicken breast and shrimp covered with cheese sauce. Served with refried beans, Mexican rice, and three tortillas. Grilled chicken breast cooked with mushrooms and sautéed onions. Covered in cheese sauce. Served with refried beans, Mexican rice, and three tortillas. Grilled chicken breast topped with shrimp, sautéed onions, bell peppers, and tomatoes. Covered with cheese sauce. Served with refried beans, Mexican rice, and three tortillas. Chunks of grilled chicken cooked with Mexican sausage to get its unique taste. Finished with cheese sauce poured on top. Served with refried beans, Mexican rice, and three tortillas. Grilled chicken breast topped with pineapple slices and sautéed onions. Finished off with a splash of cheese sauce. Served with refried beans, Mexican rice, and three tortillas. Grilled chicken smothered in our cheese and chipotle sauce. Served with Mexican rice, lettuce, sour cream, pico de gallo, and three tortillas. T-bone steak served on a skillet with sides of refried beans, Mexican rice and a tossed salad. Tortillas (3). T-bone steak served on a skillet, and cooked with sautéed onions, bell peppers, and tomatoes. Served with refried beans and Mexican rice. Tortillas (3). T-bone steak served on a skillet and topped with sautéed onions and mushrooms. Covered with cheese sauce. Served with refried beans and Mexican rice. Tortillas (3). T-bone steak served on a skillet, and cooked with five grilled shrimp, sautéed onions, bell peppers, and tomatoes. Served with refried beans and Mexican rice on the side. Tortillas (3). A Bean chalupa, cheese enchilada, and refried beans. B Two bean burritos topped with cheese and red sauce. C Bean burrito, cheese enchilada, and bean chalupa. E Cheese quesadilla, grilled vegetable quesadilla, and cheese rice. F Grilled vegetable taco salad with mushrooms. G Grilled vegetable chimichanga with mushrooms. H Bean burrito, cheese enchilada, Mexican rice. Pork chunks served with lettuce, pico de gallo, guacamole, and one fried jalapeno. Rice and beans. Corn or flour tortillas. Pork chunks covered in green tomatillo sauce. Served with lettuce, guacamole, slice tomato, and rice. Includes three tortillas. Pork chunks grilled with jalapenos and onions. Served with rice and beans. Corn or flour tortillas. Choice of pork, al pastor, steak, grilled chicken, chorizo, chipotle shrimp, or fish. Three corn tacos filled with sautéed onions and meat. Topped with chopped onions and cilantro. Served with tomatillo sauce. Grilled shrimp cooked with onions, bell peppers, and tomatoes. Served with refried beans and Mexican rice. Tortillas (3). Grilled shrimp served with lettuce, guacamole, pico de gallo, and Mexican rice. Tortillas (3). Grilled shrimp cooked with mushrooms and onions. Topped with cheese sauce. Served with refried beans and Mexican rice. Tortillas (3). Grilled shrimp covered in cheese sauce. Served with lettuce, onions, bell peppers, slice of tomato, shredded cheese and Mexican rice. Tortillas (3). Shrimp grilled with pineapple slices and sautéed onions. Served with lettuce, pico de gallo, guacamole, and Mexican rice. Tortillas (3). Grilled shrimp cooked with pineapple slices and Mexican sausage. Cheese sauce poured on top to finish it off. Served with refried beans and Mexican rice. Tortillas (3). Grilled mahi mahi seasoned with our special recipe. Served with a bed of cabbage, steamed veggies, and Mexican rice. Grilled tilapia seasoned with our special recipe. Served with lettuce, guacamole, pico de gallo, and Mexican rice. Grilled tilapia covered in cheese sauce. Served with lettuce, onions, bell peppers, chopped tomatoes, and Mexican rice. Tilapia grilled with pineapple slices and sautéed onions. Served with lettuce, pico de gallo, guacamole, and Mexican rice.